I had originally intended to post this on Thanksgiving day, as I thought they would be an appropriate choice for any table, however lightly- or heavily-laden. Vibrant with mustard and gently but deeply sweetened with maple syrup, they provide a new and moderately pungent counterpoint to the typically rich holiday fare. But not to veer too far from the path of familiarity, so important on such a day, these rolls have a soft texture and convivial pull-apart nature that keeps them firmly in their obligatory place in the bread basket. These tender breads are a welcome departure from the plain, unadorned dinner roll, but are delicious enough to win the admiration of any staunch traditionalist. 1. In the bowl of a stand mixer, whisk together the milk, mustard, butter, maple syrup, and egg, until combined. Reserve 2 ounces (about 1/2 cup) of the flour, and add the rest to the wet ingredients, along with the salt and yeast. 2. Using the paddle attachment, mix at low speed until all the flour is moistened and a rough dough forms. Switch to the dough hook, and knead at medium-low speed until smooth and elastic, 6 to 7 minutes. Add the reserved flour as needed to form a soft dough that clears the sides of the bowl, but still sticks to the bottom. 3. Turn the dough out onto a lightly floured work surface. Pulling the outer edges into the center, shape the dough into a round ball. Transfer dough, smooth side up, to a large lightly oiled bowl, turning to coat with oil. Cover tightly with plastic wrap and let rise at room temperature until doubled in size, about 1 hour. 4. While dough rises, make the glaze. Whisk together the butter, maple syrup, and egg. Cover and set aside. 5. Lightly grease a baking sheet, or line with parchment. Turn the dough out onto a lightly floured work surface, and press gently to deflate. Divide the dough into 4 equal pieces, then divide each piece into 8 to 10 small pieces (for a total of 32 to 40 rolls). 6. Keeping the unused pieces covered loosely with plastic wrap, shape each piece into a round ball. Transfer to the prepared pan, leaving 1/2 inch or less space between each roll. Brush the rolls with some of the glaze, and cover loosely with lightly oiled plastic wrap. Let stand at room temperature until doubled in size, about 1 hour. As they rise, the rolls will grow to touch each other. Thirty minutes before baking, preheat the oven to 400º F, and place a rack in the middle position. 7. 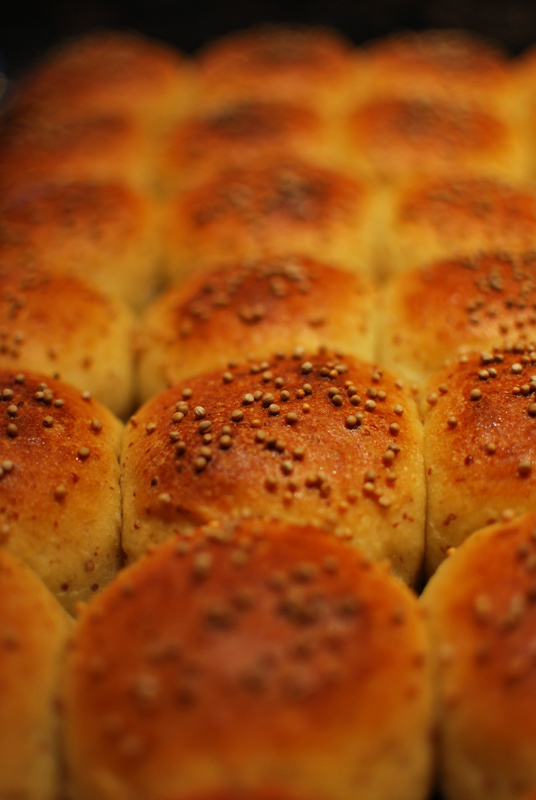 Brush the rolls with remaining glaze (you may or may not use all of it), and sprinkle with the mustard seeds. Bake at 400º F for 20 to 25 minutes, or until golden brown. Rotate the pan halfway through to ensure even browning. Set the pan on a rack, and cool the rolls on the pan for 20 minutes. Serve immediately, or remove to a wire rack to cool completely. 1. Rolls may be made 1 day ahead and kept covered in a cool dry place. Alternatively, they may be wrapped well and frozen for up to 1 month. Thaw at room temperature, or by heating in a 350º F oven for 5 to 10 minutes, or until heated through. These are excellent! Lovely and complex. I was lucky enough to be served these for my Birthgiving dinner.